Ikaw ba ay… marunong magluto, determinado, may gustong patunayan sa KUSINA… at nais IPAGLABAN ang inyong PANGARAP? SUMALI NA na pinakabagong cooking reality show ng GMA7– KITCHEN SUPERSTAR! Lahat ng 18 – 50 years old, magaling na cook pero walang culinary school training,at handang sumali sa reality show ay may pag-asang manalo ng ISANG MILYON! Magpakilala na sa auditions! Dalhin ang specialty dish (good for 2-3 people) at 1 valid ID with picture. 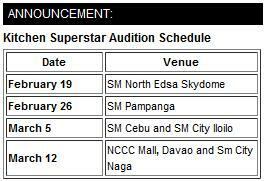 From the thousands that will audition nationwide, 21 cooks will be chosen to come to Manila. Then they will be tested to cook right away and 15 will be chosen to go on. All of them will be housed in one venue andelimination rounds will be held each week until they proclaim the winner who wins not only cash but Marvin’s guidance to put up his own resto business. - Any cook or chef with complete formal classical training or works under a classically trained chef is NOT qualified to join. What to Bring for the Auditions? Magniningning na ang mga Kitchen Superstar!